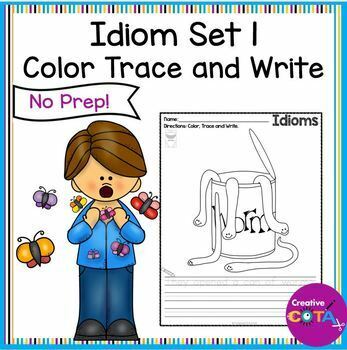 This is a no prep idiom sentence writing resource. 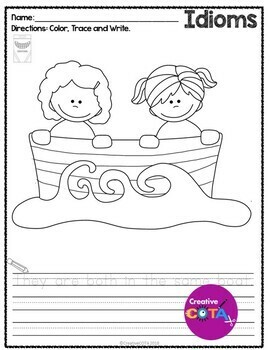 Great classroom or small group activity with a simple sentence to trace and then write. 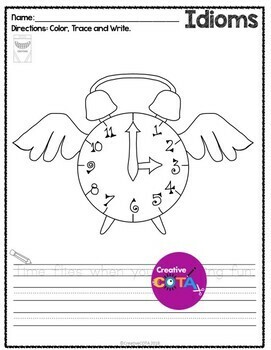 This coloring resource can be used for summer school, early finishers, small group therapy sessions, occupational therapy, speech therapy, classroom activities or can be left for a substitute. 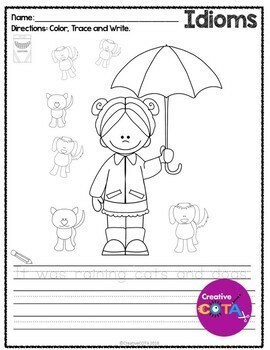 Students color the pictures and trace and write a sentence. Pictures and sentences included for the following idioms: I'm all ears, when pigs fly, time flies, sick as a dog, walk on eggshells, raining cats and dogs, piece of cake, in the same boat, hold your horses, head in the clouds, frog in the throat, fish out of water, cry over spilled milk, cold shoulder, can of worms, butterflies in my stomach and apple of my eye.